Check out my video breakdown of Alabama defensive tackle Quinnen Williams. What Quinnen Williams does well. What Quinnen Williams does not do well. Why eat steak, sushi or swordfish for dinner when you can order IHOP Rooty Tooty Fresh ‘N Fruity pancakes for just $7.99? 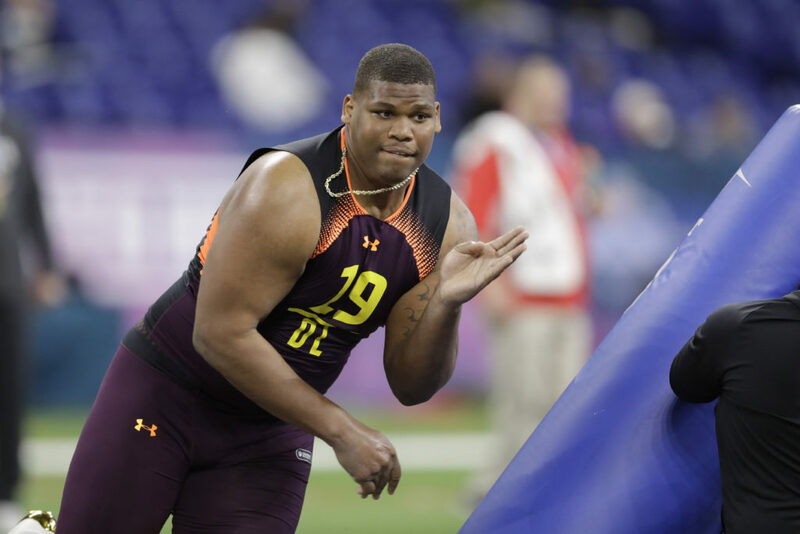 It’s unknown whether Alabama defensive lineman Quinnen Williams chose that limited-time offer during his team dinner with the San Francisco 49ers, but that’s where he met them in Tuscaloosa, Alabama. Lance Zierlein of NFL.com ranks Williams as his No. 1 overall prospect, and mock drafts almost universally have him going top four, per Walter Football. If Williams is the 49ers’ pick, he’ll be happy to know that there’s one IHOP in the team’s home of Santa Clara, California, and three more in nearby San Jose. Doesn’t do terribly well against double teams–until he splits ’em…“Splits the double team and tackles the running back behind the line of scrimmage.”. Would love to have a loafing compilation featuring 2019 draft prospects. Who would make the All American Loafing Team? Wonder what the football world will be saying about Williams in 2035? Grant, thanks for the breakdowns. The 0-Tech play goal line play is a puzzle even before the snap. Only 3 players with their hands in the dirt? Once the ball was snapped it looked like a planned run (or pass) stunt. Maybe a calculated gamble hoping it was a pass or wide run. Someone may have blown the defensive play call. After careful consideration I really don’t know which of Allen, Bosa or Williams I want at pick 2. Pick 2 – Raiders trade 4+24+ (2020 4th), taking another quarterback. Guaranteeing 49ers two of Bosa, Allen, Williams falling to pick 4. Yep, the Jets can keep dreaming cuz it ain’t happening. Maybe the Jets are having flashbacks of Marc Gastineau? Murray probably goes 1 unless Gruden pulls off something crazy w/Ari and trades 4,27,35 equals #1 points but don’t think so. SF gets Bosa probably b/c nobody’s going to deal for Haskins at #2 I believe, that’s my feeling now…Then QW and Allen go to the Jets and Oak any order. So Oak passes on Haskins. D. White I think goes 5, now Haskins goes to the Giants at 6 or could slide more to even 10. Sweat probably goes 7 even w/med issues. Then J. Taylor at 8, R. Gary at 9 and Oliver goes 10. I wasn’t going by any teams needs, just guessing. Can’t wait to the draft. Gruden wants to move on from Carr. Mayock wants Haskins, so AB has a big strong armed QB who can deliver the ball to him. Giants will miss out on Haskins if they wait. Niners have the key to Haskins, and can get a boatload of picks for him. If he moves on from Carr to Haskins it means he is either a terrible talent evaluator or a terrible coach. Carr was in the NFL MVP conversation before he met Gruden and is only 27 years old. A picture is worth a thousand words. Gruden, looking askance at Carr, said it all. Yes, Carr got them to the playoffs, before he became injured, then went 6-10, and last season, 4-12. Gruden wants his guy, and Carr aint him. Gruden is a terrible talent evaluator? The guy who traded away Mack and Cooper? One of the sheep that thinks trading Cooper was a bad idea. Raiders robbed the Boys on that one and they will be stuck paying a guy 20 mil per that has one good game in four. Gruden made some mistakes but that wasn’t one of them. PS – Carr is the QB in 2019 and rightfully so. There isn’t a QB in the league that could have saved the Raiders last season with their roster yet he still put up good numbers. They have a lot of holes but QB isn’t one of them. Cowgirls were in a tailspin until Cooper was picked up. He saved their season, and they got into the playoffs, because Cooper replaced Dez. Again, Gruden is one person who has a hard time disguising his emotions. Those looks he gave Carr along the side line said it all. Mayock will tell Gruden that Haskins is superior to Carr, because he is. Carr was chosen by the previous GM, so they want their guy, not Reggie’s. McKenzie selected Carr, Mack and Cooper. 3 of those 4 are gone, and only Carr remains. Gruden won’t spend those draft picks on Haskins with the 49ers, don’t always believe what they say. If Gruden trades w/Ari his 4+27+35 like said above he still has #24 and could land Hakeem Butler now w/Murray, big if ! !…Or sit and waits for Haskins at #4 and he falls in his lap if the really wants him w/o spending draft picks. Chance the Giants move up but Haskins may be there at #6.? Kingsbury loves Murray, and will take him with the first pick. He will not win with Rosen, so he will not give up his franchise QB. Jets wants to trade back, so they will deal with the Giants if no one deals with the Niners. That means the Raiders miss out on Murray and Haskins if they wait, and Gruden is an impatient man. Gruden has a ton of draft capital, and will want to spend it to get what he wants. My scenario has him giving up an additional second and 4th round pick, so he still gets to keep 3 first round picks. He should be happy with that. Gruden can then get a pass rusher and WR with his 2 later first round picks. If the Giants wait until the 6th pick, they will miss out on Haskins, for sure. Jets want to trade back, Raiders want Haskins, but another team may trade up with TB to poach Haskins before the Giants pick at 6, like Denver, Miami or Washington. All of this Rosen is ‘one and done’, he’s gone “talk” could be just a smoke screen by Arizona trying to drum up support for Murray. Rosen was an overall 10th pick in the ’18 draft. As a 2nd year player he may just stay there for now no matter who they dream about. The Cards need DL help and they might be trying to hopefully trade down with the Raiders for 2-1st rd and a 2nd rd pick for 5’10” Murray. If Arizona picks Bosa or Q. Williams, SF will probably get the calls from the Raiders and N.Y. Giants for their 2 1st and 4th rd picks. There could be other teams calling. I also think Haskins isn’t picked really early but who knows. It’s true the Raiders and Giants might hold on hard to their precious draft picks, even with Gruden’s 3 1st rd picks and just draft BPA. SF would then get Bosa or Q. Williams if no teams call or make a decent offer for Murray at #2. Then the Jets might trade down with Oak or Giants wanting Murray. If no deal, NY takes Allen/Q. Williams, then Oak takes Murray only if they didn’t already trade up for him. If Murray’s gone, then Gruden takes Allen/Q. Williams. It’s possible Haskins is taken by the Giants only if he isn’t picked up for a team trading up w/Tampa. Haskins can slide more if Tampa and Giants decide to go with D. White and Sweat or another player and if a team doesn’t trade up good enough picks with those 2 teams for Haskins. It will be interesting. Why would Oakland trade for a rookie unproven QB to run a complex offensive scheme like Gruden’s style? Gruden has shown through his history that he wants veteran QBs with experience and knowledge. 49ers need a QB more since their QB just tore his ACL last year and he will be the one needing better protection. All the so called experts are idiots for thinking that Oakland will draft a QB. Oakland wants a desperate QB needy team to believe that so they will trade in front of Oakland to get a QB. Year in and year out Franchise QBs are over drafted due to the need. Last year FA QBs were a disaster. -Minnesota went backwards with Cousins. -Denver again moving on with another old cast off in Flacco. -Redskins taking Denver’s mistake with Keenam. -NY Giants still stuck with an old and pathetic Manning. -Miami trying to squeeze another year from journeyman Fitzpatrick. -Jacksonville praying on Foles big contract for another FA miracle. -Cincy time with Dalton is dangerously coming to a close because he has taken them no where and new coaches usually wants new QBs to lead their team in a new direction. -Patsy can’t truly believe Brady will be around much longer. Wake up! Your having a dream! According to Pauline, QW’s naivete has them worried what may transpire after he gets a lot of money. If his play shows an undisciplined player, chances are it’s not restricted to his play on the field. Naive+undisciplined+$$$=concern. Could be nothing, could be something. No way to really know for sure. We won’t be taking him anyway. Barring unavailability or trade, Nick Bosa will be the pick. Nice breakdown, Grant. He kinda reminds me of Kevin Williams…. All the sports networks reported that about Kaep’s heist. That wasn’t a Grant phenomenon. Grant didn’t report that. He was relaying it. Sounds like you are already blind. Theres alot more plays of Q Williams beating double teams than not. He single-handedly destroyed LSU and beat double teams for sacks in that game. U cant predict how anybody will be with alot of money but he has a chance to be legendary. The fact is really have to know what your doing evaluating DTs as they dont typically put up huge stats. If your not experienced at it, you have no point of reference. I’m concerned about his ability to take on double teams in the run game. If you were picking a different D-Line in this draft who would be an alternate choice? Oliver? I agree Cassie. Williams wasn’t treated nicely by IHOP’s strawberry parfait, but did some damage when staff double teamed him with the buttermilk fullstack and rooty tooty, fresh and fruity shortstack, with carmel topping. No, the 49ers don’t need another interior lineman. Your specs on QW are spot on. Allen – slow to read plays and not NFL strength ready. QW – you never want to hear the word “loaf” associated with a player especially in a championship game. Bosa – is a quick reader who will not “guess” or “loaf.” He is strong and a high motor guy. Arguably the most NFL ready player in the draft. A talent like Bosa is hard to pass up. Unless the 49ers make a jaw-dropping trade down, Bosa will be chasing down QB’s reminiscent of the ol’ Gold Rush days. If you think Allen is slow to read plays, wait until you see Bosa try to decipher misdirection. Allen will need to rely on speed for the next couple of years while he develops his football chops and more strength. Last year Harold Landry was the toast of the town around these parts leading up to the draft. Landry might turn out to be a pro bowler, but if his first year is any indication of his play going forward, he’s going to need more time. Like Landry, Allen is going to find out that NFL players are no joke. Bosa is going to need to develop in some areas, but getting to the QB won’t be one of them. AES…. Allen is known to be a quick study. Remember he had one year with NFL talent coaching and led the nation in sacks and DP honors. He gained muscle very quick after his first season. With the talent on the front 7 of this team right now, he will fit in nicely and quickly. Now Bosa on the other hand. Nobody has seen him play for a year, character issues are a concern, and injuries. His ceiling is probably reached and again nobody has seen him play for a year. How would other teams schemes adapted to him? Would they have tested him more? We don’t know these things. I’d take Bosa in a minute if he continued all season playing at a high level. Number two is a big pick for a guy like Bosa if this team truly cares about character and willingness. Bosa has something to prove in those cases. Allen is a big talent. He checks all the boxes except for one. He does not diagnose quickly and looks confused at times. I’ve seen him disappear in a crowd and unable to find his way out. Someone here said last week that it may take Allen a few years to reach full football maturity and I agree with that. Waiting a few years for a player to become elite puts this #2 pick in S. Thomas airspace. I agree with your Bosa take. His character and injury history may be a big concern, but it may not be as big as some here have made it either. Yes, we didn’t get to see much of Bosa last year because of his injury, but I’ve seen enough of him to believe that he is going to be impressive at the next level. He’s not (as someone said) being touted because of his name. If that was the case Joe Montana’ sons would be in the HOF and Evander Hollifield’ son Elijah would be ranked as the best RB in the draft. Bosa is ranked the top player by most of the pundits for a reason. He’s earned it. Things will get very interesting by this time next month. I certainly that hope that a couple of O. G. PD bloggers like us are happy with the draft outcome. Reading plays can be taught, talent can’t. Allen doesn’t have the talent that Bosa possesses and he’s WAY too small to be a 4-3 end. Loved watching the “Gold Rush” of Cedrick Hardman, Cleveland Elam, Tommy Hart and Jimmy Webb. I remember one game they sacked the Rams quarterback something like 9 times. You’re probably right about the sacks in that game. I was fortunate enough to watch the game on my dinosaur 20″ TV. My memory isn’t quite the way it used to be, but I thought the 49ers had about 12 sacks in the game. I remember the 1989 playoff game when Haley and Roberts caused Jim Everett to sack himself. Jim “Chrissy” Everett was a sack magnet back in the day. I just watched Brown and Evans put Bosa on the ground. Watch Grant’s analysis of Bosa’s weaknesses. Bosa with his short arms will be unable to keep the tackle’s arms from reaching his chest, then it is all over. Allen during the Georgia game was engulfed by the tackles, too. He did get a couple fumbles, but the ball popped out right in front of him. QW did have a good game against Clemson, but the Clemson offense took the heart out of the Alabama defense, and it showed in the 4th quarter, all along the line. This just confirms my opinion that the Niners should trade back, and get Sweat or Ferrell. Clelin Ferrell went up against that monster Alabama line, and did well. Sweat with his elite speed, can get around the corner, and his long arms will keep the Tackle’s arms off his chest. Even Rashan Gary, who weighs 277 lbs, may be superior to Bosa or Allen. Seb, how much more arm length does Allen have over Bosa? I hear that it’s minimal. Btw, I see a trade as well. Making the Bosa Williams, Allen convo a moot point. AES, yes, both Bosa and Alen have short arms, so Sweat would be the best option. I just think that sometimes we get caught up with the measurables. John Ross had the football world on its feet two years ago with his blazing combine speed. That incredible speed has yet to translate in the big league. If you can play, that’s all that matters. Just imagine how players like Zach Thomas and Sam Mills would have faired if they were noted only on physical measurables rather than abilities. My point (as I said earlier) is that we don’t know how these players will do at the next level until we see them play. On a different note, I agree with you that the 49ers could seriously field trading partners on draft day. AES, I will concede that both Bosa and Allen could become pro bowlers, and either would be a nice pickup for the Niners. Glad you agree that the trade back is actually the best long term strategy for rebuilding the team. I am eagerly anticipating this draft. But for all we know Lynch may pull a surprise like last year when he went with Oline when the majority of the pundits and fans were thinking Pass Rusher. Hey Sebbie…. AAF game in San Antonio has an attendance >20K. And you said only a few hundred…. Sebbie! An update! The crowd in attendance is around 30K. Yawn, guess they are following my advice, and giving away tickets. I really like Williams. I think he’s the best player in the draft. He could play big end in base, DT in nickel. Or he and Buckner could rotate at big end. He may have some stuggles against double teams occasionally, but he can play NT as well. Very versatile. And has game wrecking ability. The 49ers already have four big ends: Arik Armstead, Solomon Thomas, Kentavius Street and Jullian Taylor. And Williams is better. I understand the redundancy with previous picks, but we’re talking about an elite talent. Armstead played some NT towards the end of last season from memory. Williams could also play some snaps there. Buckner can also play some big end with Williams at 3T. All of that is in base anyway. Nickel is more important. Buckner, Williams and Armstead can rotate at DT in nickel. Thomas expendable unless he shows significant improvement. Armstead played NT on passing downs last season. He’s not built to take on combo blocks in the run game on first down. Ah right. For some reason I was recalling him getting some reps there in base as well, spelling Jones. But probably mis-remembering. Williams could help consolidate the position by cutting the fat. Half of those players might need to wave goodbye. We need the Fat when the injury bug creeps up. Lynch would be out of his mind if he drafts a DT….when there is an obvious need at the edge…..
Where in the world did you come up that loads? NO ONE has ever.made that claim about him. Not one coach, scout or teammate. In fact, he is known to be student of the game, works hard in practice and watches film endlessly. Get your facts before attacking character. Site your source, if you want push that narrative. And with this personality bs. Kid is nothing but an A+ player and hard worker. Any player can affected by money. I just don’t see Bosa as our man…I haven’t heard anyone yet bring up that Bosa is only 6’3″ and lacks the room to grow…Allen is 6′ 5″ and already has long arms as well as the ability to cover, and and speed into the QB….I WANT SACKS…! Allen’s arms are shorter than Bosa’s, his hands are a full 2 inches smaller than Bosa’s, and his lower body is slender when compared to Bosa. After obtaining Ford, the chances of Allen being the pick dropped exponentially. Bosa, to the chagrin of some fans, is the perfect compliment to Ford. Ford/Bosa will be our version of Avril/Bennett…. Btw, Bosa is 6′-4″ tall, not 6′-3″ according to NFL Player Profile/Combine. Bosa is 6036, and the 49ers don’t need a fifth big end or a backup Leo. Drafting Bosa is not redundant, and he’ll make our sacks more abundant. Grant, I have to ask. Now that Allen’s arms are shorter than Bosa’s, will you be moving him down your board? Where are you getting the info about having shorter arms? I’m waiting for Grant to make a big stink about Allen’s shorter arms, just like he did with Bosa. If not, I’m calling hypocrisy bs…. Still waiting to hear how his arms shrunk since the Combine. I call b.s. Arm length doesn’t really matter for speed rushers, though. Hard to believe his arms shrunk. Take the consistent basis which is where both guys were measured by the same people – at the combine. Scooter, we’re talking about .50″. I don’t really think it matters to anyone but Grant. He is right about this one. Bosa’s arm are an issue because he doesn’t have a really quick first step. He needs longer arms than the tackle because he will be engaging him and winning with technique and strength. A tackle with longer arms is an issue for Bosa and he will likely disappear in games vs any long armed tackle. That’s my only concern with Bosa but it’s a pretty big one. I have to say … I get a kick out of people who claim Bosa is not quick enough to be an effective edge rusher. First off … Nick’s 10 yard split at the combine was faster than his brother Joey. In fact, Nick’s 10 yard split led all DE’s at the combine. Nick also jumped higher, and ran the sort shuttle quicker than his big brother, all indicators that he’s quicker than his brother Joey, who, BTW, set an NFL sack record through his first 20 games and has already been named made All-Pro. Nick also bested his brother on the bench press, so he appears to be even a little bit stronger than his big brother as well. Joey is about an inch taller, and about 10 lbs heavier, but Joey’s arms are only 3/10ths of an inch longer than Nicks. The 49ers better not overthink this. It’s either a trade back, or Nick Bosa at #2, if he doesn’t go #1 overall. The 49ers know this. It’s time for the fans to realize that this is the logical pick, and be thankful that the 49ers landed the consensus #1 defensive player in this draft class. Hey Ernst82, if 33″ arms are such a concern, how is it that Joe Staley has had such a stellar career? I’ll tell you why. It’s because he’s so Eucking good at everything else. Would 34″ arms make his job easier? Sure would, but to say it’s a big concern is so laughable that my sides hurt…. Oooh, big concern am I right? No! Wrong, wrong, wrong. Too much thinking leads to stupidity. We will be drafting Nick Bosa #2, and we will be very fortunate to have him! You’re right Razor. Joe Staley will be the first to tell you it’s all about the fundamentals, i.e. footwork and technique. Sure, it’s not an advantage to have relatively short arms, but Nick Bosa doesn’t have short arms. His arms are at least average for his size. Nick Bosa has honed the craft of a DE. He’s powerful, athletic, fundamentally sound, and relentless. That’s why he’s special. He’s had the fundamentals drilled into him on a daily basis, and he’s worked hard to develop his technique. This is a guy who practices hard and plays all-out 60 minutes per game, and doesn’t’ take plays off. Is he the best athlete in the draft? Depends on how you define athlete. Bosa had impressive numbers at the combine, specifically he was a top performer in the 10 yard split, the short shuttle, and on the bench press, so heck yes he’s a good athlete. More importantly, he’s a great football player. Yah, he got hurt? Up until he got hurt he hadn’t missed a game in 2+ seasons. That doesn’t scream injury prone to me. The Niners are either taking Bosa (who is the consensus BPA around NFL circles) if he’s on the board, or trading back. It’s not rocket science! Bosa would be the strong side DE in nickel. How is that redundant, given its exactly where you see Allen playing? maybe not, but I sure don’t see Allen as the answer. I predict his production will be similar to Fowler. In fact, I might wager that Montez Sweat will be better than Allen next year. Allen came in at 6’4 7/8, close to 6’5. However, he had short arms and small hands, red flag at that height, weight and slender lower body. Also, Allen did not impress at combine. Was slower in the 3 cone and and 20 yard shuttl e, which is more important for a DE than 40. Interesting, per the combine his arms were a half inch longer. And now at his proday they have shrunk massively? It seems like the measurements are a bit dependant who is measuring and where they measure from. Shoup, the point is it doesn’t matter. It’s a stupid argument when talking .50″. Dumb & Dumber. And I’m Not sure I’d classify .51″ shrinkage as massive but whatevs. You know used to think long arms were a big deal? Trent Baalke, that’s who. He consistantly took players higher than he probably should have, based on measurements – arm length in particular. Ah, the stench of Baalke, and the way Seb touts Sweat’s combine numbers, it would seem he has become intoxicated…. Aldon Smith was very productive, averaging a sack a game, but his personal failings destroyed his career. He had a 90 mil contract dangling in front of his face, and threw it all away over a woman who did not want him. Alcoholism is an insidious disease, and I partly blame Baalke for not handling the situation better. He should have cared more for his players, and provided an environment with help so they did not self destruct. Some call it baby sitting, I call it nurturing. Niners failed with Foster, too, so I hope they have learned their lesson, and will be more proactive in the future. I’m not sure how this comment relates to Baalke’s love of long arms, Seb? And I certainly don’t know why you keep touting 40 yard dash times as if it’s some kind of prognosticator for an NFL DE? 49, Grant also mentions long arms keeping the O linemen from getting to the pass rusher’s chest. We all saw during the Senior Bowl practices, Sweat would prevent those hands from grabbing his chest. Believe it or not, the 40 time does tell a lot about a player. That is why players with slow 40 times do not get drafted early. Speed kills. My point is that 40 times vary in importance based on position Seb. DE is not a position where the player relies on the “long” speed measured by the 40. A receiver or DB, sure. Any position that requires the player to travel the distance of 30-40 yards per play, on a regular basis. – Much, much more important is how quickly a DE covers the first 10 yards off the line of scrimmage. More often than not, it’s within that 10 yard radius where a DL causes most problems for a QB. Nick Bosa had the fastest 10 yard split of all DE’s at the combine. – The 2nd most important event at the combine for a DE is probably the Short Shuttle(20 yards), used to evaluate the quickness and change-of-direction ability of players by scouts, particularly for the NFL Draft but also for collegiate recruiting.which shows short area quickness and agility. Nick Bosa recorded the 3rd quickest time @ 4.14 seconds, bested by only 2 edge rushers, both considerably smaller than Bosa. Outside of these 2 events, the 3 cone drill would probably be the next event (Bosa ranked 11th, with an impressive time of 7.1 sec) although just as importantly, you want to watch how naturally and smoothly the DE moves around the field. After that comes the Bench Press, the Vertical Jump, The Broad Jump, and finally, the 40 yard dash. In fact, evaluating a DE’s overall health is more important than their 40 yard dash, and that’s my point. Bosa moves more like a Jaguar than he does a Cheetah, extremely thick through his beefy thighs, and powerfully built, with big strong hands and strong muscular arms, stalking his prey, ready to pounce. Exactly the kind of player you want opposite Dee Ford, IMO. How’s it going my friend. As I mentioned to Seb, if a player can play, that should supercede the measurables. Dwight Freeny was only 6′ 1″ and Elvis Dumervil was shorter. But these guys were successful because they knew how to play the game. One thing that I really like about Bosa is that he knows how to use hand technique to put himself in position to be successful at the next level. Great technique helped players like Freeny and Dumervil make up for physical deficiencies and the could be true of Bosa as well. We’ll have to wait to see how that turns out. We’ll draft a difference maker. The cake is baking, and we’re about to get the icing. I want Allen too… his ability to bend around the corner is my reasoning. I think it’s hard to judge him until you line him up next to Deforest Buckner. He will not see double teams more than 50% of the time lined up next to Deforest Buckner. It’s going to be pick your poison. Great stuff grant.. Any chance you can show us some WR prospects? So…while we are putting in requests for next, how about your opinion on which players might by tradable. Who is currently under contract that u don’t see in the team’s future that might have trade value. Who do you think they should trade/dump/get rid of or just move on from? Dang, I was hoping you would take a look at Burns, Sweat and Ferrell. Really enjoying these breakdowns. Thanks. I’ll do them, too. Appreciate it. Looking forward to it Grant! I’m want to see your breakdown on Arthur James Brown. OK, A. J. Brown. (Ol’ Miss). Deep WR class. Gonna probably have to be a 2 part series. The Gold and the Fools Gold. Grant you talk too much, man. Just play the dang film and you can talk while it’s playing. Grant’s doing fine…..Just enjoy it and not nit pick. He’ll do Sweat, Burns, WR’s and others next so we’re getting great breakdown info. Grant, to me, is a must read, and his video analysis is a must listen. I learn so much. How much of this ‘analysis’ of a player is anecdotal (“I am looking for a video example of…oh, here it is! Now I can add an hors d’oeuvre to go along with my bias.”) and how much of it represents something essential, a chronic disability of sorts? Double teams are by nature difficult but they also mean that someone else is not being double teamed, and if that someone else is a Buckner, then so much the better. Besides, from what little I have seen of QW being double teamed, he blows by them. As one blocker noted, his is an oiled-covered express train. Given QW’s power and relatively good speed, I wonder if the Niners can rethink how to use two powerful, disruptive men. End conversion–a Reggie White redux? How about a 7- 1- 4 alignment; i.e., a Tiffany lamp instead of a wanna-be pyramid (cf, Buddy R). Imagine the fun we’ll have this August when preseason games come and go. Each hugely meaningful–at the moment. Most of us will go freakin’ nuts–a bipolar typhoon of rage and ecstasy. Can’t wait. Naaaa. I’ll pass on the overblown run stuffer and settle for the sack guys like Allen or Bosa. Why overblown? You mean QW obsession with pancakes, with adding baked flour and fructose syrup to his body, exposes his inner doughboy? I have to agree: his past successes aside, the NFL will bake him down to size. Throw the bum out (or eat him)! I’m impressed with people’s confidence here: every rumor, every half-baked impression, or deadline screed becomes hard fact and harder belief: so-and-so will succeed, so-and-so will fail, 49ers must not …etc. A little modesty might help, or a sense of one’s own miserable history at predicting succcess. Me too: I hereby refused to be seduced by doughboy. Waymac….. are you alright? Wtf did that come from? Mostly from the heart and from a little from my a…. I pass by lots of forums of this sort and am in awe at the assertiveness of its members, an assertiveness (maybe I should use the word certainty) cobbled together from scattered reports and remembered impressions from other sites and video clips, leading to an almost shameful overreach. Not so different, alas, from what goes in a political forums and other forums, places I’m on the lam from. Worse, I learned from my years and year of over-obsessing about the draft, that there is sometimes that awful doubt a week or even less after it’s over: “Should I really have invested that much time and energy into something so meaningless in the long run?” An addiction, for sure. Nick F’n Foles….45 MILLION DOLLARS GUARANTEED!!!!! OMG I can’t breathe I’m laughing so hard. Over his now 7 year career he’s started an average of 6.3 games per season. He’s only appeared in 54 games total starting 44 of them. His record is 26-18. He’s only started in more then 10 games in a season twice but never appeared in more then 11. Over the past 3 seasons he’s started 9 games. Foles is light years better than Bortles. Struggles against the zone defense. That warrants 45 mill in today’s NFL. Good luck Jax. At least he’s better than BB gun. Can McVay save BB gun? Only “Fair-to-Middling” as a QB……. But did just fine negotiating his opportunity and best intere$t$. I think many are taking these breakdowns as a way to downgrade these prospects to quickly. I personally believe Williams is the best interior Dlineman to come out in years and will be better than Buckner by the end of his second year. Additionally, I think he can play the nose on the few downs they are in base, and rush the passer next to Defo in our nickle or packages. Even saying that I would not draft him as I think its a minimal upgrade for the team. Bosa is my top ranked DE in this class and I do believe he will be very similar to his brother in that he will be a very good player who will put up solid numbers from day one. I also think that he will go silent in games against certain types of tackles… but that doesn’t really make him that different from most other top edge rushers. He’s a Big End/ Edge Rusher in our system and probably has the highest floor at a position of need. Allen is an interesting player who I think could be the best pass rusher in this class by his 4th year, especially when considering his size and how quickly he has developed as an edge rusher with minimal experience and coaching. His upside is Kahlil Mack, and his downside Barr. I don’t see him busting but it’s possible he doesn’t realize his potential as a pass rusher. He’s a SAM backer/ Edge Rusher in our system which probably makes him the best fit for SF. While I like the idea of trading down I think there is a huge dropoff from these guys to everyone else, and the bust potential goes way up. In fact, I think the 2 (3 before Simmons injury) next best Dlinemen after these players are all defensive tackles. Here is where it gets tricky, in that I likely wouldn’t end up drafting an edge rusher in the event of a trade back. White, Baker, and Willams are all more valuable to me than either Sweat or Burns and I’m not certain either one would be available by their next pick (perhaps Burns). You think Williams will be a better 3-technique than Buckner? Why? Why, because I think he is quicker, a better hand fighter and stouter at the point of attack than Buckner already. Additionally, he is a far more complete prospect than Buckner was at this point in his career and he did this as a sophomore against the best competition college football has to offer. He was the best player in college football last year but I still believe he doesn’t help the team as much as some others would. What happened to Williams against Clemson? How did he make an impact in that game? You’ve already shown some clips of what he did. He didn’t fill the box score stats sheet like he had in some previous games, but he was still impactful. And that was despite their best edge rusher not playing. Williams was their only real pass rush threat that game. Maybe Williams should get on the Aaron Donald program, ‘cuz that IHop diet showed up late in that game. Yeah, just think how good he could be once he gets an NFL program teaching him how to eat right and improve his conditioning. His team got beaten badly. He played well though. He drew consistent double teams, had at least two tackles for loses (the .5 was a direct result of his play), a hit on qb, and beat his man so badly he drew a tripping penalty for a 10 yard loss. Unfortunately for him it’s a team game and his db’s couldn’t cover or tackle in that game (which made me very happy). Clemson ran rough shot over Alabammy. Game wise yes, but not running wise. Alabama mostly shut down their running game. Clemson had 347 passing and 135 yards rushing. This sounds ok until you take a closer look. – Of those 135 yards, 94 came on the final drive when the game was over (The score was 44 -16). Without that drive, Clemson runs for a total of 41 yards. That’s right, Shoup. Lengthy OT’s present a challenge to all edge rushers. I do not think there is a drop off after Bosa, Williams and Allen. I think there are superior alternatives. Sweat, with his elite 40 time and long arms, is just as good as all 3, maybe better. Rashan Gary played through pain last season, and did well. He is bigger and faster than Bosa. Ed Oliver is an intriguing prospect. His quickness jumps out on the film, and he can lay the wood. Ferrell just helped Clemson win a National Championship, so I hope Grant uses that National Championship game like he did with Q Williams, to do his film analysis. Jaylon Ferguson had 17.5 sacks, best in the nation. Polite, even with his red flag, had some impressive game film. Winovich, Ximines, Jelks, Collier, Hollins, Banogu and Miller are later round prospects. The draft pundits called this a very deep draft in the pass rushing department. There are more than 3 elite prospects. I agree about trading down, Shoup. Dangerous when there’s only 16 players with 1st round grades. Means you can’t go any lower than Miami…. Jonathan Delmark has a new video analysis, link below. This one’s on the play that “sold him” on Jimmy Garoppolo. Thanks to cubus for turning me on to Delmark. Thanks for posting that George. Very informative. At the end of the video, Delmark said he is currently working on reviews of Jordan Matthews and Solomon Thomas. He said it will take some time because he is going to be reviewing a lot of their film (full year review for Thomas). Looking forward to it. Yeah, his videos are worth waiting for. Thanks again. Damn straight they are! It was a pipe dream a few months ago. Could have been talking about Bosa Dunderwiffle, a promising long snapper out the East Fenwick Taxidermy Academy. There’s a DB who plays for San Antonio that’s a thief. He leads the AAF in picks. He should get a look. Speaking of San Antonio, an NFL team there would kill. Jerry and the McNairs would never allow it. Yup. Good sized crowd in attendance last night. Josh Allen. Sam LB, Edge on Nickle. Dee, DFO, Arik, and Josh in the front… I believe is our best d line. Even better than bosa with the other 3. But I’m about to look at this guy Brian Burns. And Sweat. To see what they have pass rush wise, as opposed to Allen.